Do you want to rotate a small video file? We have already seen a Free Video Flip & Rotate software for rotating any video file. 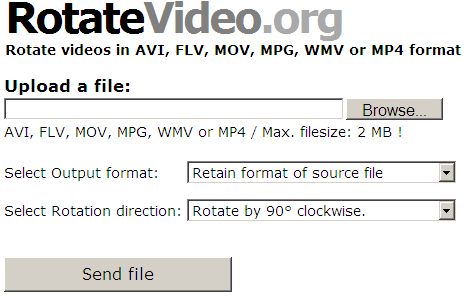 You can also do this online without having to install any software at RotateVideo.org website. It allows rotating small video files upto 2MB of formats like: AVI, FLV, MOV, MPG, WMV or MP4. 1. Open RotateVideo online tool website. 2. Click ‘Browse’ button to select video file on your computer. 3. Select the output video file format from dropdown menu. 4. Then select rotation direction. 5. Click Send file to rotate the video file. Are you kidding me… only 2 MB??? Max file size 2 mb ,only convert 5 seconds of movie LOL.